Are you aware of your state's laws regarding street harassment? If you are not it is time to flip the script and raise your awareness! Street harassment is a global problem for women and girls. It limits our ability to move about in public spaces. It is disrespectful and at times it can also be a very uncomfortable or scary moment in our lives. I thought that I had matured to the point that being harassed would no longer be an issue in my life. However, I have had a couple of experiences recently that made me realize that the problem spans generations of the female population. Being harassed was a problem that I had grown accustomed to dealing with during my youth and also as a younger adult woman. It is a problem that I hope will be eliminated by the time my granddaughters grow up. No woman or girl should feel uncomfortable with anyone verbally disrespecting them or feeling that any form of aggressive behavior towards them is okay. If you have to deal with street harassment and feel that it time to take action there is a publication that you should be aware of. 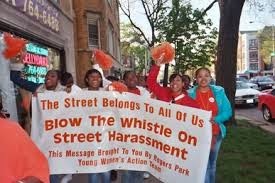 There is an online toolkit thanks to the organization Stop Street Harassment that provides information by state about different laws that can be used to help you stop street harassment. There is also a lot of useful content that will help you to become familiar with a lot of different aspects of this problem. Here is the link to the Stop Street Harassment website. I hope that you will become aware of what you can do to protect yourself. Share this information with your loved ones and your friends. Oh by the way, while you're there check out the plans for the International Anti-Harassment Week which will be going on from March 31 until April 5, 2014. Poll: How often do you experience street harassment?